A retina specialist treats diseases and performs surgery on the retina and vitreous. The retina is the light sensitive tissue that lines the inside of your eye. The vitreous is a watery gel which fills most of the eye. Diseases of the retina, such as macular degeneration and diabetic retinopathy, are leading causes of blindness in the world. Fortunately, blindness is often prevented with timely diagnosis and prompt medical attention. There are many systemic diseases which may affect the retina and vitreous. High blood pressure and diabetes are common examples, but other, less common, diseases such as auto-immune, genetic or rheumatologic diseases can require the attention of a retina specialist as well. The video “What is a Retina Specialist?” is provided by the American Society of Retina Specialists (ASRS). The basic operation performed by a retina specialist is called a vitrectomy. 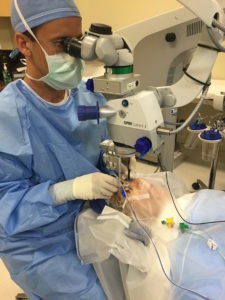 Removal of the vitreous is often needed to allow safer access to repair problems with the retina, such as a retinal detachment, remove an epiretinal membrane, repair a macular hole, etc. Sometimes only a vitrectomy is needed to remove blood or to remove floaters. A retina specialist may also perform intraocular injections for macular degeneration or swelling of the retina. Laser treatment is often required for repair of a retinal tear, treatment of retinal vascular occlusions or complications from diabetes. It is difficult to know if your vision problems are due to your retina. Most patients consult their own eye doctor who will make an appropriate referral to the retina specialist. I work with many of the eye doctors in Orange County and most of my patients are referred to me when a retinal disease is diagnosed or suspected. The best way to find a retinal specialist is to consult your own eye doctor. If you do not have an eye doctor, the local emergency room would be your next best option.